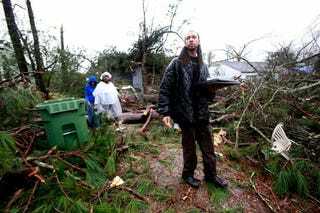 A deadly storm ripped through southern Mississippi early Saturday, killing four people and flattening dozens of homes and businesses, according to the Associated Press. The death toll is expected to rise. The city of Hattiesburg confirmed the deaths via its Twitter account. The city also said that firefighters and police are going door-to-door to try to rescue victims. The city’s first black mayor, Johnny DuPree, has signed an emergency declaration for the majority-African-American city, which reported “significant injuries” and structural damage including flipped cars, homes and other structures shredded into piles of wood and debris. In February 2013, hundreds of homes were destroyed and over 60 people injured when a twister touched down in Hattiesburg. William Carey University also took a major hit from the storm, WDAM-TV reports. USA Today reports that more than 12,000 were without power in the region. The three counties affected are Forrest, Lamar and Perry. A spokesperson for the Mississippi Emergency Management Agency said that the tornado touched down in Lamar, plowed through Forrest and then struck Perry before dissipating. Flash flood warnings were also in effect for northern Forrest and Lamar counties, as well as southeastern Jones and Marion counties. The National Weather Service said that 3-5 inches of rain have already fallen, raising the risk of flooding, and that more rain is possible. Brent Barfield, spokesman for the Mississippi Highway Patrol, said that there are “gas leaks everywhere,” according to USA Today. The agency is reporting that Interstate 59 north of Hattiesburg is closed because of debris and downed power lines. The public is asked to stay home and avoid traveling if possible.